On Saturday the 22nd of September, Lionel Sosa and My Story, presented the back story to why the Children of the Revolución was created. The Children of the Revolucion TV series on KLRN and other Texas PBS stations tell the untold stories of the descendants of the those fled during the Mexican Revolution. A panel discussion followed the screening of a summary of show. Distinguished guests who are passionate about this historical moment in the history of Mexico and Texas shed wonderful light on the subject. They included Lance Aaron, Kathy Sosa, Dr. Teresa van Hoy, and Ricardo Danel. Below is the a brief invitation from the Alameda to view the shows in their Alamedita Theatre during the month of September. As part of its program activity for Hispanic Heritage Month, the Museo Alameda would be delighted to highlight your successful production of “The Children of the Revolución.” This will include screening of each of the twenty segments of during the month of September at the Museo’s Alamedita Theatre and a panel discussion with invited experts. At the request of Professor Rocio Ocon fromTexas Lutheran University, the producers of Children of the Revolución and TLU faculty, staff, students and Seguin residents came together at the Dunne Conference Center to dialogue about the very important Mexican Revolution TV series on KLRN that has been produced by Lionel Sosa and My Story. Joining the panel were Alejandro Maya and Jorge Conde of My Story and Ricardo Danel, historian of the UNAM and Alameda Mexican Revolution project. 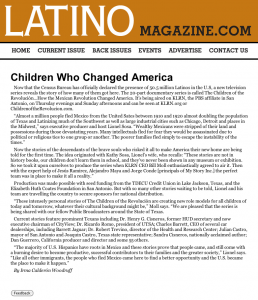 “The Children of the Revolucion” begins showing in Houston PBS on April 4, 2011 11:00 PM with Henry and Elvira Cisneros.